For years, a resident of Regal Heights Healthcare and Rehabilitation Center made an annual pilgrimage to see legendary Philadelphia DJ Jerry Blavat perform. This resident has known “The Geator with the Heater” and “The Boss with the Hot Sauce” since his own days spinning records. However, this year instead of helping this resident attend a Blavat concert, Nico Zaballero, A.D.C., the facility’s Activity Director, decided to bring the performance to Regal Heights. Zaballero is used to planning a variety of seasonal events for Regal Heights’ residents – but he said this ranks up there as one of the most special. Zaballero and the team at Regal Heights managed to get in touch with Blavat’s agent and arranged for a concert at the facility that lasted for hours. When Blavat walked into the room, the first thing he did was give a shout-out to the resident. “The resident’s reaction was just priceless, with his smile so big and his eyes so wide,” recalls Zaballero. From there, Blavat led about 150 residents, their families and the staff on a trip down memory lane – recalling his time spent with the Rat Pack and his days as a television personality. In the prime of Blavat’s career, his listening audience grew to an estimated half-million teenagers per month, and many of these residents were his original listeners. The residents then got up and danced as Blavat began playing tunes from past decades. Zaballero said he was only able to pull off this event with the help of the entire staff – from the nursing staff that got residents ready for the event to the kitchen crew who prepared food for everyone. 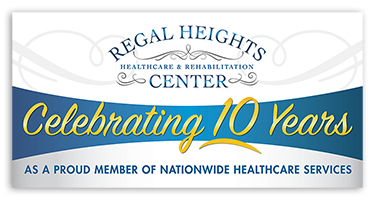 Regal Heights is one of six skilled nursing facilities in Pennsylvania and Delaware operated by Nationwide Healthcare Services LLC. To accomplish that goal, Nationwide facilities work closely with the surrounding communities to build strong partnerships that ultimately benefit the residents and make them feel more comfortable and at home. Another of Nationwide’s facilities, Sterling Healthcare and Rehabilitation Center in Media, PA, specializes in providing opportunities for residents to engage with students and younger volunteers. In addition, Renaissance Healthcare and Rehabilitation Center in Philadelphia has dedicated part of its land to be used as a local dog park to foster regular visits from pets and their owners.